Free or cheap international service is something many US carriers have been doing lately. Not having to buy a separate SIM card when you travel abroad is a very nice convenience, even if some aspects of your plan suffer a bit. Today, Sprint has announced that it's ramping up its international service to 165 countries, as well as some other new tidbits. The headline feature here is that big 165 number, which Sprint is quick to point out is superior to the "only" 145 countries that T-Mobile sports. It's also greater than the ~100 countries that Verizon TravelPass and AT&T International Day Pass offer. Sprint's international plan is actually pretty similar to T-Mobile's. Both are automatically activated. You get fairly slow data, with Sprint claiming speeds up to 2G and T-Mobile ONE offering up to 256Kbps (which Sprint erroneously states as 256Mbps in its chart). You also get free texting and $0.20/minute calls with both providers. It gets interesting with high-speed data, though. T-Mobile doesn't offer any high-speed options outside of Canada and Mexico, leaving you at that aforementioned 256Kbps in the other 143 countries. Sprint high-speed data is reportedly LTE in 90% of areas that customers use international data, and can go as low as 3G. This can be had for $5 a day or $25 a week in most countries (see the picture above for exceptions) - less than VZW's TravelPass and AT&T's International Day Pass, which go for $10 a day. Additionally, LTE and long-distance calls are free for Unlimited Freedom subscribers that visit Canada and Mexico. This is all a significant improvement over Sprint's old international high-speed data add-ons, which were priced at $15 for 100MB for a day, $25 for 200MB over 7 days, or $50 for 500MB over 14 days. It pretty much offers the best international high-speed value, though I'm sure that John Legere is already thinking about how T-Mo can beat it. Lastly, Sprint notes that the entry fee is just $50/line with its base Unlimited Freedom plan (it'll automatically switch to $60/line next year), while T-Mobile's is $70, VZW's is $80, and AT&T's is $90. Interestingly enough (to me at least), the fact that T-Mobile ONE includes taxes and fees into its price is noted in Sprint's chart. These changes could make Sprint worth looking into if you travel frequently. You do have to have your primary usage in the US, though. If you're already a Sprint customer, you don't have to do anything to get this good stuff switched on. 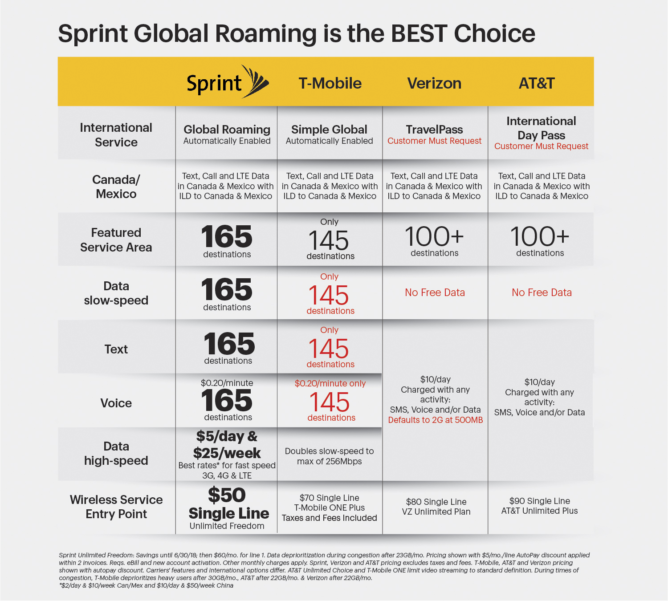 OVERLAND PARK, Kan.--(BUSINESS WIRE)--Sprint’s (NYSE: S) industry leading global roaming service just got even better. Customers with the this service automatically receive an incredible international experience when traveling abroad that includes free basic data coverage, free texting and voice calling at $0.20/minutes in 165 international destinations1. With Sprint, international services simply work for customers. There is no plan to accept and no up-front or monthly charges to enable international service on their smartphone. Customers get great service around the world, just like they do at home on the Sprint network. There are a lot of things to plan for when traveling internationally, but wireless connectivity shouldn’t be one of them. With Sprint, services and rates are clearly presented when customers turn on their smartphones in a foreign country. And customers have free access to a fantastic data management portal which provides real-time data usage detail. The user experience is perfectly transparent and there is no chance of data overages, ensuring Sprint customers don’t have to worry about bill shock when they return from their trip. If customers want a fast experience, they can purchase affordable high-speed data on-the-fly directly from their smartphone with just a few simple clicks. No advanced planning required. No need to call support. Sprint’s high-speed data services now include LTE in destinations where 90 percent of international data is used by our customers. Sprint customers with an Unlimited Freedom plan receive free LTE high-speed data roaming, voice calling and text messaging while traveling in Canada and Mexico, as well as free International long-distance from the U.S. to these countries. Sprint’s international roaming enhancement is another element to the new customer-centric approach, “Works for Me.” This approach showcases Sprint’s renewed promise of working obsessively for its customers and delivering solutions that “work for them” on their terms. Customers can learn more about Sprint international services and the 165 featured destinations as well as other details by visiting www.sprint.com/globalroaming, a Sprint store or calling 1-800-SPRINT1. 1 Requires capable smartphone and domestic service plan. Primary usage must occur on the U.S. Sprint network. Service may be terminated or restricted for excessive international use.